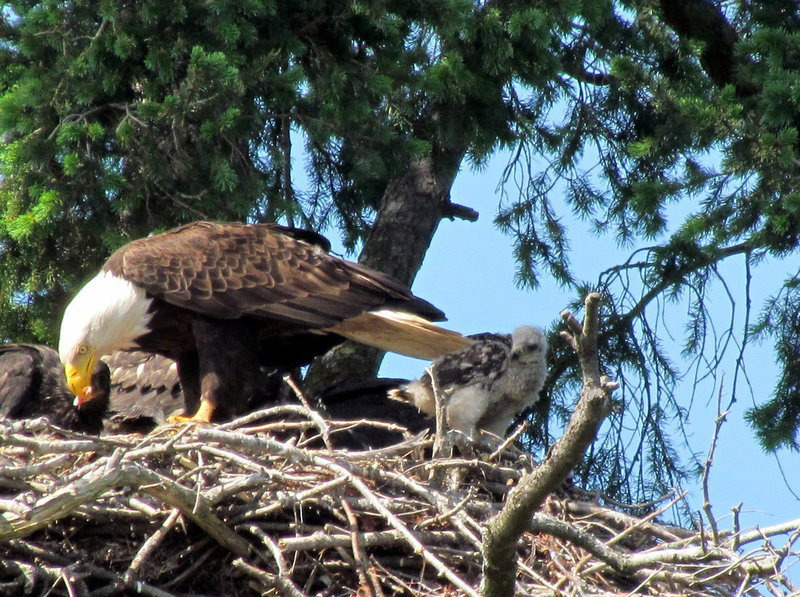 In an eagle nest near Summerset Place on Roberts Bay in Sidney, BC, a story line unfolded like a Disney movie. Observers began to spot a baby Red-tailed hawk in an eagles’ nest living side by side with three very large eaglets, and seeming to be doing quite well. How in the world did the little Red-tail hawk happen to be in this nest? How the hawk came to be in the eagles’ nest has been a topic of debate. Some say the mother eagle may have brought it to feed to its eaglets, but cries of hunger from the baby hawk seemed to trigger a maternal instinct within the adult eagles, and instead of killing the baby, the parent eagles began to feed it. The little hawk continued to receive the same care from the parent eagles as their own offspring, and it grew strong and healthy. Others believe a hawk laid its eggs in the nest before the eagles arrived and the baby hawk was the only one of its siblings to survive before being adopted. We’ll never know for sure. While eagles normally fledge the nest at about 12-13 weeks of age, Red-tail hawks fledge at about 8 weeks. And on June 22, Spunky the Red-tailed hawk made a successful fledge! Many wondered if the little hawk would come back to the nest where it could continue to be fed by the eagles until it developed hunting skills of its own, and, to the delight of everyone, Spunky did indeed return, and was fed! 7/16/17: LittleEagle (aka Spunky) continues to thrive. He (she?) 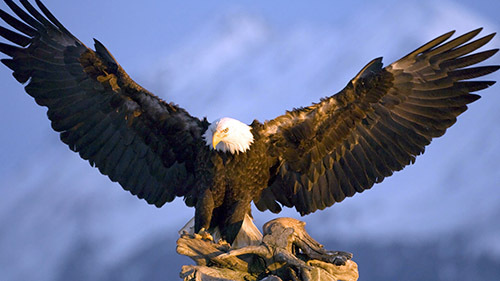 is still being cared for by the parent eagles, and has developed an eagle-like affinity for fish.